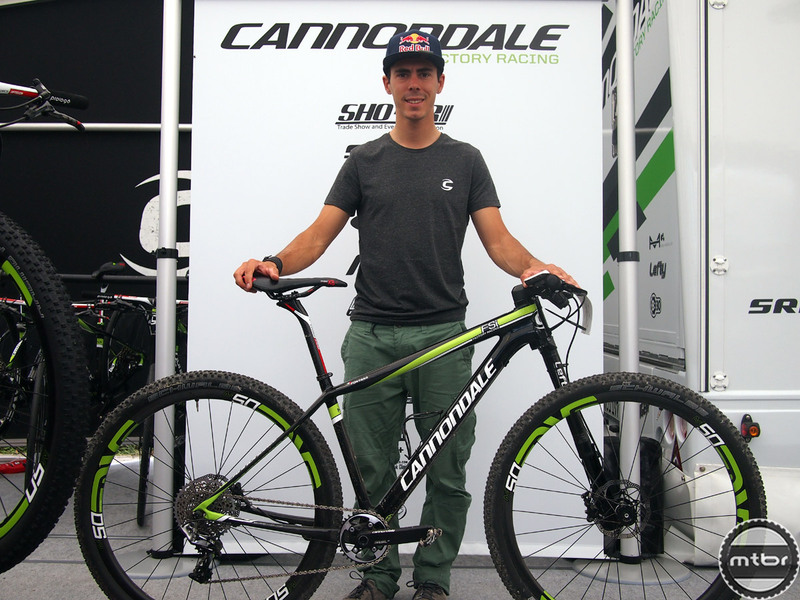 During the recent world wide launch of the all new Cannondale F-Si 29 Carbon World Cup racing hardtail that coincided with the UCI XCO World Cup in Albstadt, Germany, I had the pleasure of meeting Cannondale Factory Racing team member Marco Aurelio Fontana. When writing about mountain bike racers and industry celebrities, it is standard form for writers to refer to them by their last name. However, Marco is such a warm and down-to-earth guy, I am going to break tradition and refer to him as Marco throughout this article, with absolutely no disrespect intended. 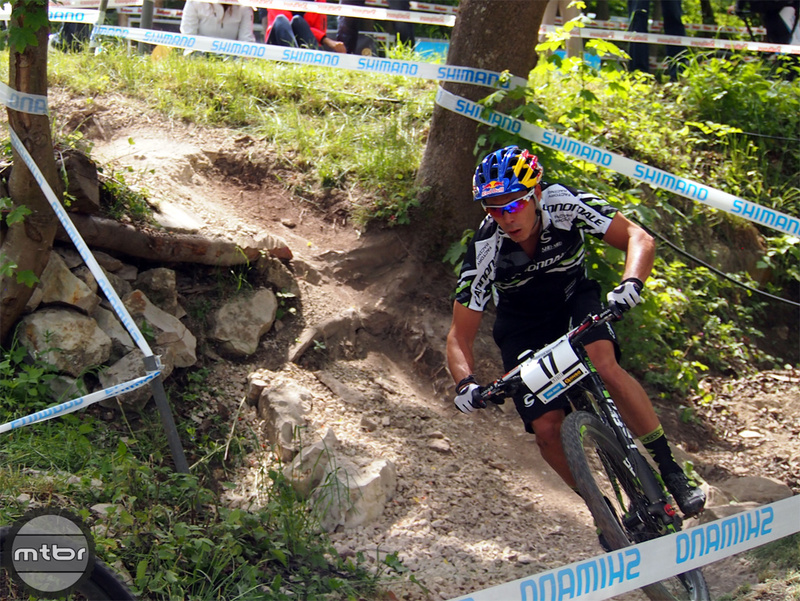 In fact, Marco has earned plenty of respect in the world of mountain bike racing, he was the Bronze medal winner at the 2012 Summer Olympics and also has the title of Italian Champion on his racing résumé. Marco calls “Podere le Calagne” (near Fiorenzuola) in Italy home and he travels a ton. He is only 29 years old, but he has had many years of bike racing under his belt. Known for his bike handling prowess, Marco is one of the batch of new school XC racers who has really helped redefine the modern day version of XC racing (and he has a humorous distaste for racing mountain bikes in anything but baggy shorts.) 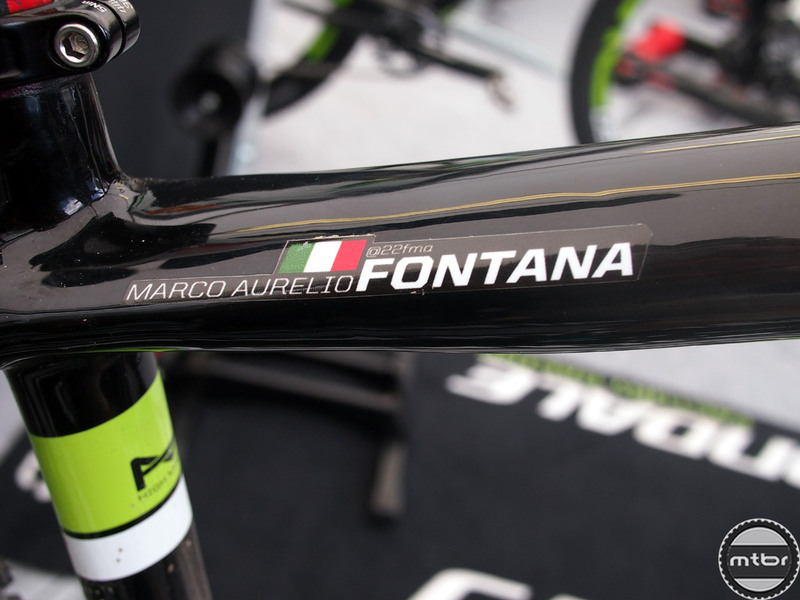 Marco and team mate Manuel Fumic comprise the heart of the Cannondale Factory Racing team and they both contributed to the development of the new bike. Here is our interview. Mtbr: Welcome Marco, thanks for your time. We traveled all the way from California to come and watch you can your team mates race! Have you ever spent any time in California yourself and if so, what is your favorite place to visit? Marco: I have visited Southern California and the sun, beach and biking are all very good over there. 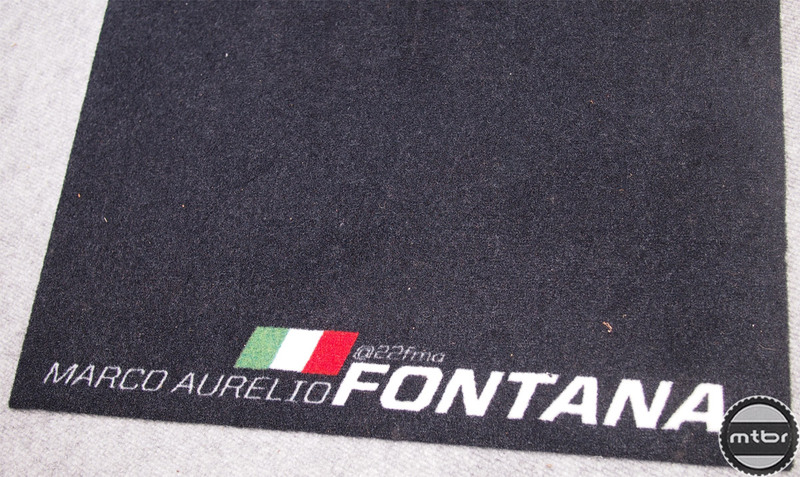 There is also a town called “Fontana” so of course, I love that place. Southern California is not a bad place to live. 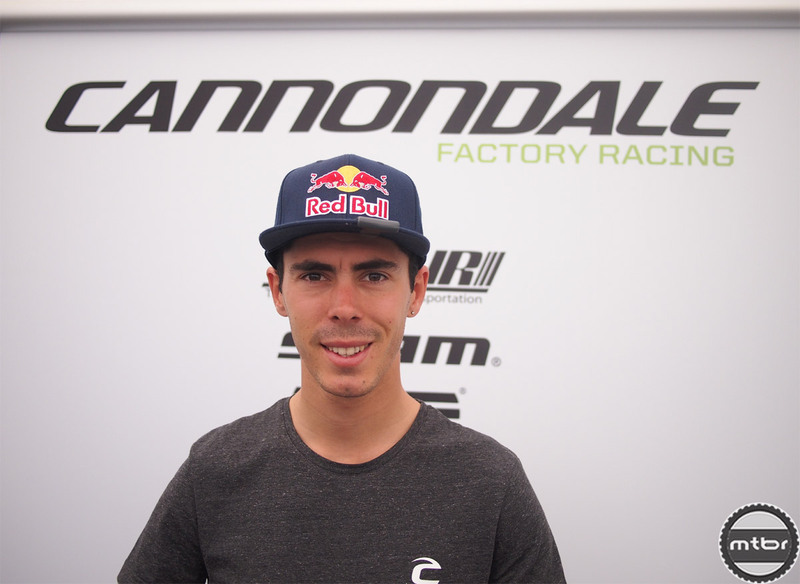 Mtbr: How long have you been racing for Cannondale now? Marco: 09. February 2009. Five great years and going strong. 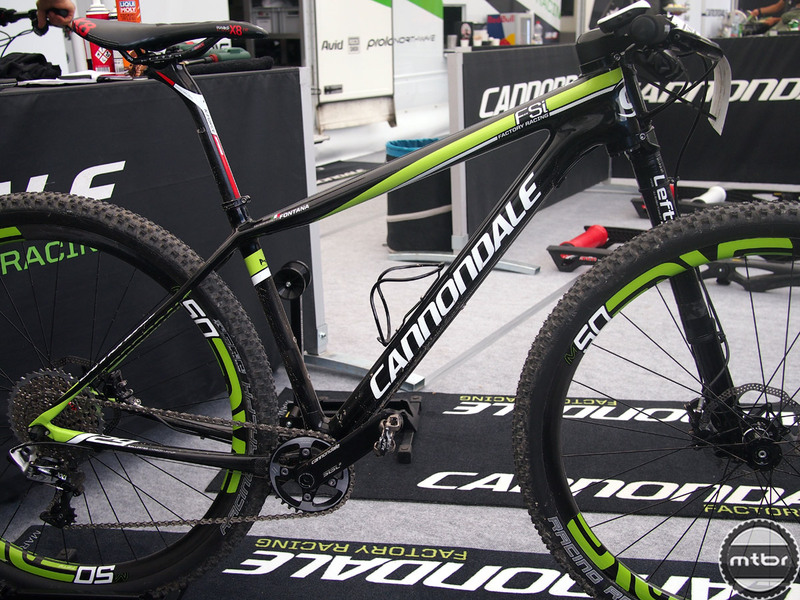 Mtbr: How much direct input did you have with the development of the new Cannondale F-Si 29? Marco: So, from a rider point of view, you can tell input so… from the riding of the old bike you can say, I like this but I don’t like that. My point was the head angle and the front part. The rear of the bike I think was already really good, really responsive. The Save rear triangle worked really well. But with the fork we were running, we had a really low bottom bracket and the head angle was too steep. Some sections were a little sketchy, not stable at high speed. So my direct input was about having a slacker head angle and a little higher bottom bracket. Because my point was, we already have an 8 kilo bike, it’s gonna be quick anyway…why don’t we slack it a little bit and have something that will be more fun, more aggressive and still fast up the hill. That was my input. And then, from there…playing with the offset of the fork, having the shorter head tube…this is something that I’m not directly involved in. I asked for a shorter headtube, but the increased offset and decreased trail is not something I developed personally. But they did a really good job with it because the bike, it rides so good and so easy handling. 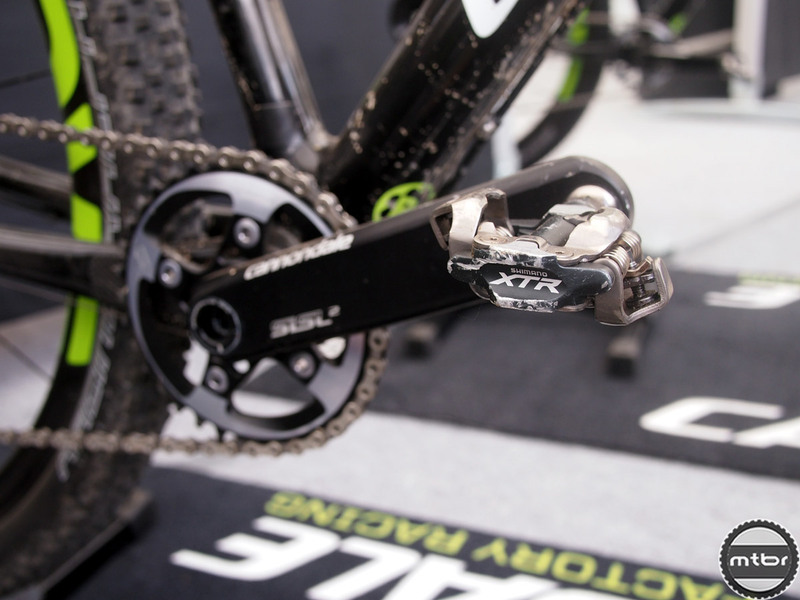 Mtbr: After they developed the prototype…how many races have you used it in? Marco: Races? 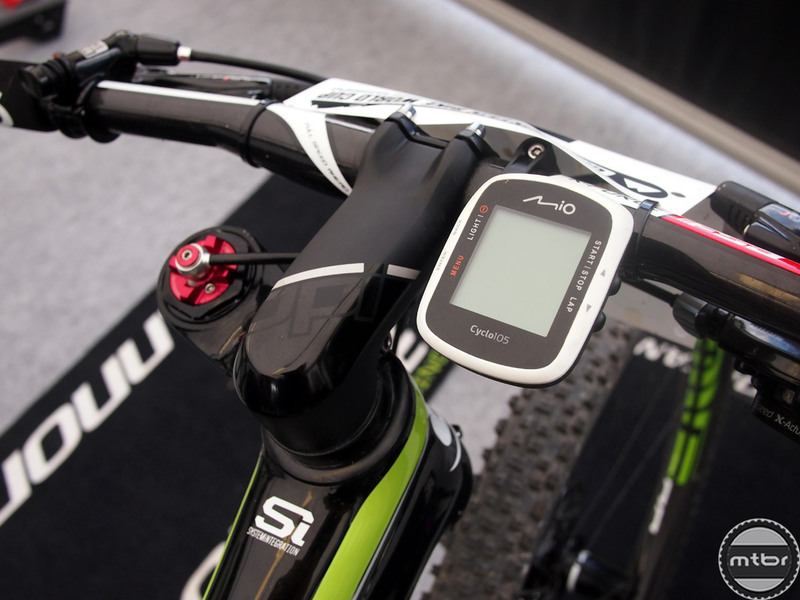 Only two…Nove Mesto and an Italian series race. But we rode the very first bike, like last year. It’s not always easy to find the time to ride the new bike and then the hardest part is when you know you have to ride the old bike and feel, like in the second World Cup in Australia…you don’t wanna train all the way with a new bike and then change to the old bike on race day. So, we had some tests in different spots …in Finale Ligure, in Tuscany…but just a few days. We didn’t spend too much time on the bike. So input, testing, and then the launch here. Pretty quick. Mtbr: Of all the courses on the World Cup circuit, which race is your favorite? Marco (without hesitation): Nove Mesto. Nove Mesto (CZE) is the best course, the best venue. They really make it attractive for people, they made a course which is challenging, it’s nice to watch, compact…it’s the best. 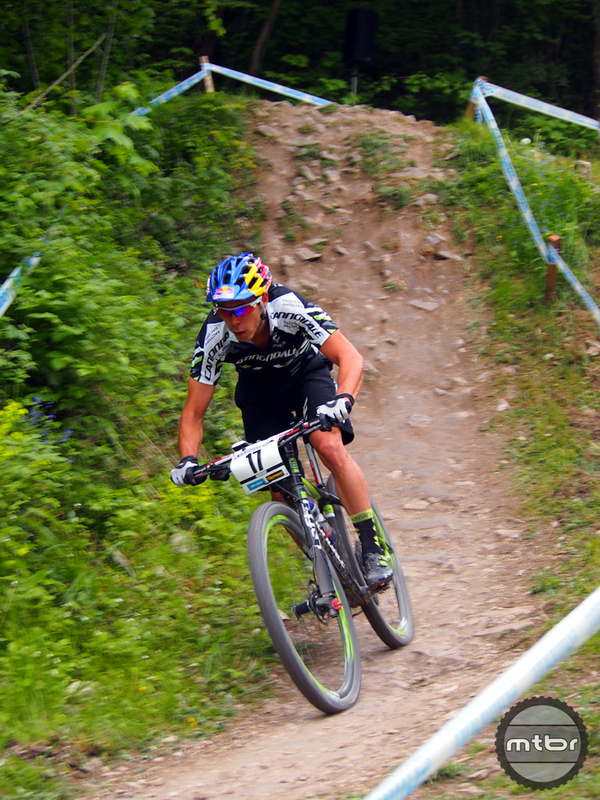 I like Mont-Sainte-Anne (CAN), Dalby Forest (GBR) is cool, Offenbach (GER) is really cool, but Nove Mesto is the best. You have great spots to sit and watch the race, big screens. The course, you have roots, some jumps, rocky section and in the meantime you have the gravel road where the filmer can follow you. It’s just great. 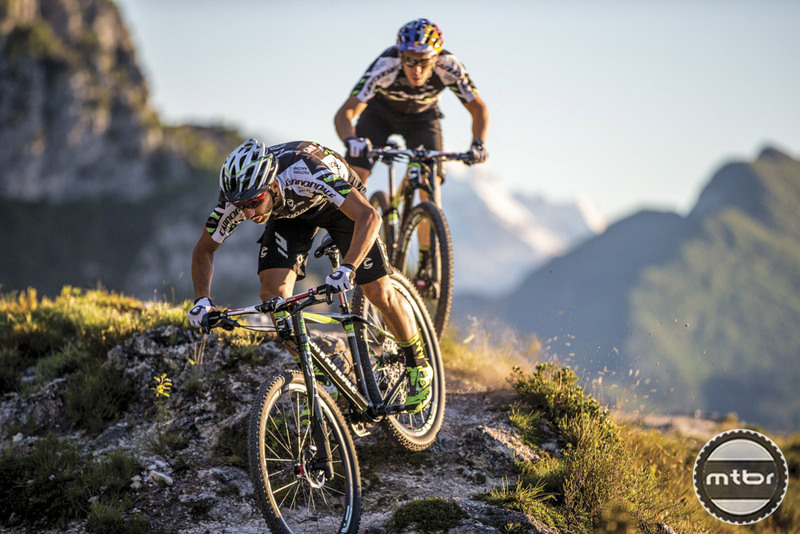 Mtbr: What do you do to train in the off season? Marco: Off season for me means…a little bit of resting …ride with my motor bikes …enjoying time with my friends and stuff. But then starts the cyclocross season pretty quick. I’m not doing lots of cross races…like maybe 10 or even less but still, you need to prepare, you need to go running and playing in the mud. My winter is based on cyclocross most likely. I like it, it’s good fun, it’s a good way to spend the winter …I’ve been doing cyclocross for ages. Mtbr: You ride motor bikes? Street bikes or dirt bikes? Featured video courtesy of Red Bull Media showing Marco’s mechanic Giacomo at work and also some cool race highlights. Mtbr: What bikes do you own? Marco: A have a Gas Gas, it’s a Spanish brand, enduro bike. As an enduro bike it’s pretty cool, the seat is low and thin, which is good for me because I’m not tall. I like to do some rough, extreme sections, some rocks and stuff, it’s not too bad. But I know lots of guys who race enduros and motocross so a few times a year a get to test their official race bikes. I’ve been riding since last November, the official Honda HM Zanardo team which is the team that has the World Enduro Champion E2 Alex Salvini, he’s a good friend of mine. So it’s cool because I have my own bike but sometimes I get a chance to use the proper, official bikes. Just a few days ago, I rode the official KTM 250 race bike of Antoine Méo who won World Champion. Marco (getting somewhat back on track): I also have a Cannondale motor bike. Mtbr: Oh yes, that’s right. I’d almost forgotten about that project. 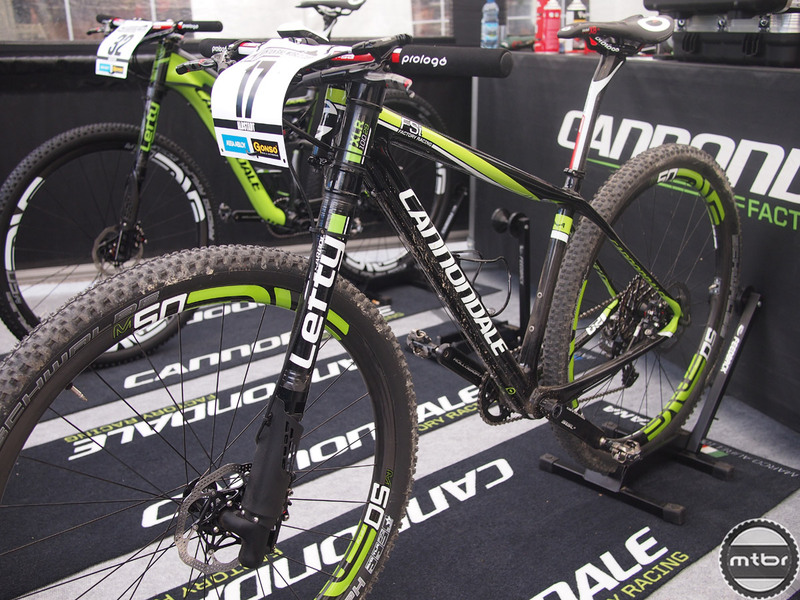 The Cannondale dirt bike. Marco: Yes. Actually it’s a super motard bike. Mtbr: Oh, you mean it’s the Cannondale dirt bike and you set it up for super moto? Marco: No, no…it’s born as a super motard. 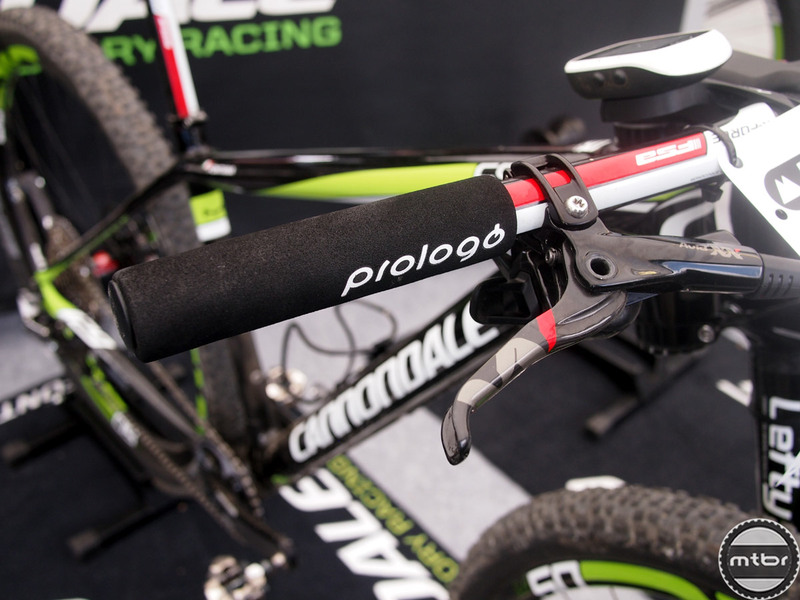 Cannondale actually made 3 versions. Mtbr: Ah, wow. 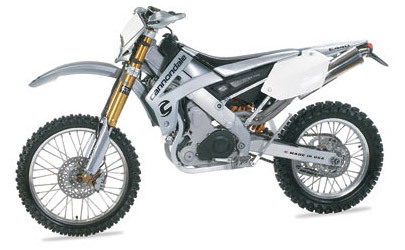 I think here in the US, we only ever saw the pure dirt bike version. Marco: Yes, very limited. Mine is #30 of 100. Mtbr: What fork is that on there? That’s not a Marzocchi. Marco: It’s Ohlins. Cannondale’s innovative motor turned back (like current Yamahas), alloy frame, hydraulic clutch…very much ahead of it’s time. Mtbr: Man, that’s a sweet rig! Well Marco, again thank you for taking the time to chat with us. It’s been a real pleasure and I’ll let you get to lunch now. Good luck in the race! At the end of the Elite Mens XCO race, Manuel Fumic finished 7th in his home race and Marco finished 45 seconds behind in 8th place.